Storm and The Village at Rockville resident share a hug. Storm, a two-year-old, 60-pound Black Labrador, is the latest addition to The Village at Rockville—A National Lutheran Community (TVAR) in Rockville, Md. 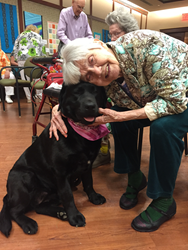 TVAR welcomed Storm on Monday, May 16, 2016—her first week consisted of training and learning the ropes with residents and staff. The addition of Storm was made possible by a donation from Metropolitan Washington, D.C. Synod’s Gifts of Hope program and the training provided by Lee Hamilton of Man’s Best Friend Dog Training in Madison, Ohio. Numerous studies support the practice of pet therapy. A German and Australian study* followed 9,000 pet owners from 1996 to 2001. The study found that pet owners had fewer doctor’s visits, resulting in health care savings of over $3 billion dollars. The Journal of American Geriatric Society (Volume 2014) suggests that a care-taking role of an animal may give older individuals a sense of responsibility and purpose that contributes to their overall wellbeing. The Journal discovered that pet owners are better able to perform certain activities of daily living, such as the ability to bend, kneel, stoop, take medication, prepare meals, bathe and dress. *Headey, Bruce; Grabka, Markus; Kelley, Jonathan; Reddy, Prasuna and Tseng, Yi-Ping. Pet Ownership is Good for Your Health and Saves Public Expenditure Too: Australian and German Longitudinal Evidence. Australian Social Monitor, Vol. 5, No. 4, Nov 2002: 93-99.